The first quarter of 2017 saw dramatic price gains for the top cryptocurrencies, as the total market added nearly $7bn in value. The so-called ‘blue chip’ cryptocurrencies – those with a market cap greater than $30m – saw aggressive growth in the first quarter, as bitcoin’s waning dominance set the stage for new players to assert themselves. Others, too, saw impressive gains that occurred relatively quickly in recent weeks. All told, the cryptocurrencies posted a median price increase (in USD terms) of 180.56% over the course of the quarter. 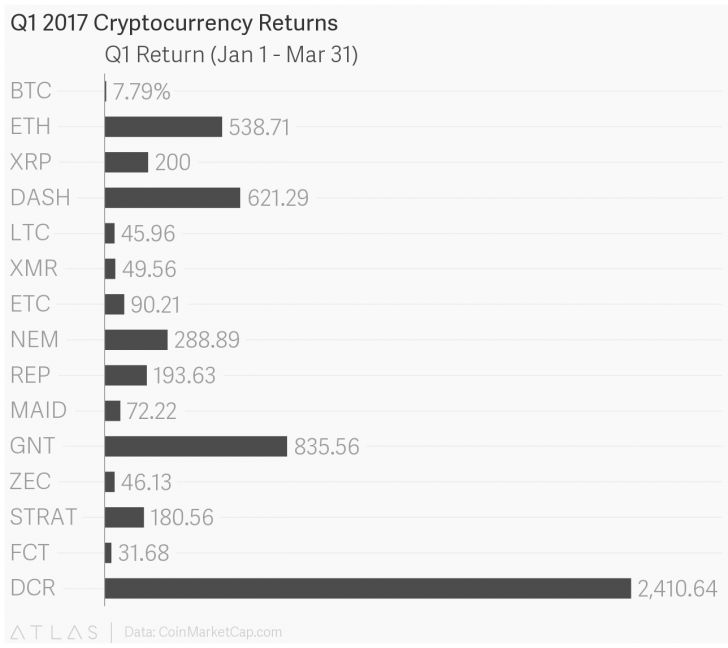 The two top performers from Q1 2017 were Decred (DCR) and Golem (GNT), which gained 2,410.6% and 835.5%, respectively. Decred is a cryptocurrency that uses a hybridized consensus system instead of relying on either solely proof-of-work (POS) or proof-of-stake (POW). Similar to bitcoin, the DCR protocol sets a 21 million cap to the number of coins generated on the network. Currently, the largest trading pair for DCR is DCR/BTC. Poloniex serves as the largest marketplace for DCR trading. The majority of DCR’s gains came toward the end of the quarter, and the highest daily volume was achieved on 27 March with $14.03m. As for Golem, most of its gains came during the latter half of Q1. Cryptocurrency exchange announced markets for the token on 17th February, and following the announcement, the price rose approximately 100% with 48 hours, from $.02 to $.04 on 19th February, with a volume of $6.67m. Prior to the Poloniex announcement, average daily volume was between $20k and $100k per day. 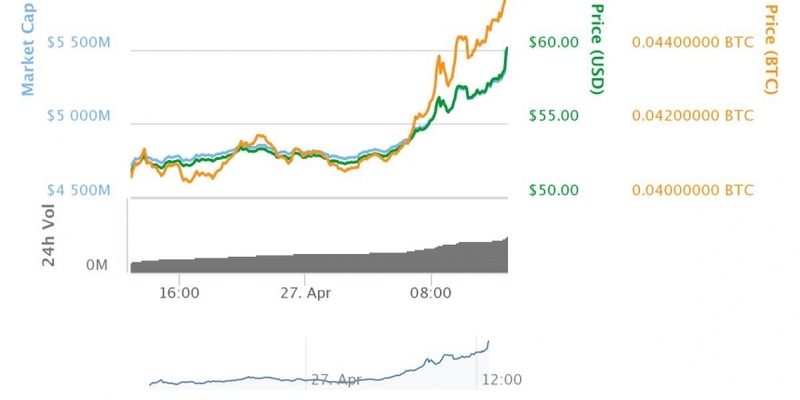 A second spike in price occurred on 21st March, following the release of news that GNT would be integrated into Shapeshift.io, an altcoin exchange platform. That particular day, the price increased approximately 22% from $0.045 to $0.055 on $5.28m in 24-hour volume. The final day of Q1, Golem developer Grzegorz Borowik published a blog post announcing Golem for macOS. The news buoyed the market, which boosted GNT to an all-time-high of $0.094 on volume of $11.4m. Bitcoin’s performance in the first quarter was more muted. The CoinMarketCap’s Bitcoin Dominance Index – which measures bitcoin’s market share relative to other cryptocurrencies – shed nearly 20%, ending the quarter at 68%. A weakening Bitcoin Dominance Index points to investor preference for alternative cryptocurrencies. Bitcoin (BTC) gained just 7.8% over the course of the quarter. This was a noticeable decrease from its 35.4% gain in Q4 2016. General fear, uncertainty and doubt has permeated the bitcoin community and can arguably be blamed for the anemic performance of the cryptocurrency in comparison to alternatives. Furthermore, bitcoin’s volatility has tapered off as a result of its maturation, coupled with the evolving narrative that the cryptocurrency is a safe-haven asset. Update #2: This article has been amended to account for the digital currency decred. Update: This article has been updated to account for market data on the dates between 26th March and 31st March.